Certificates for the QMS. 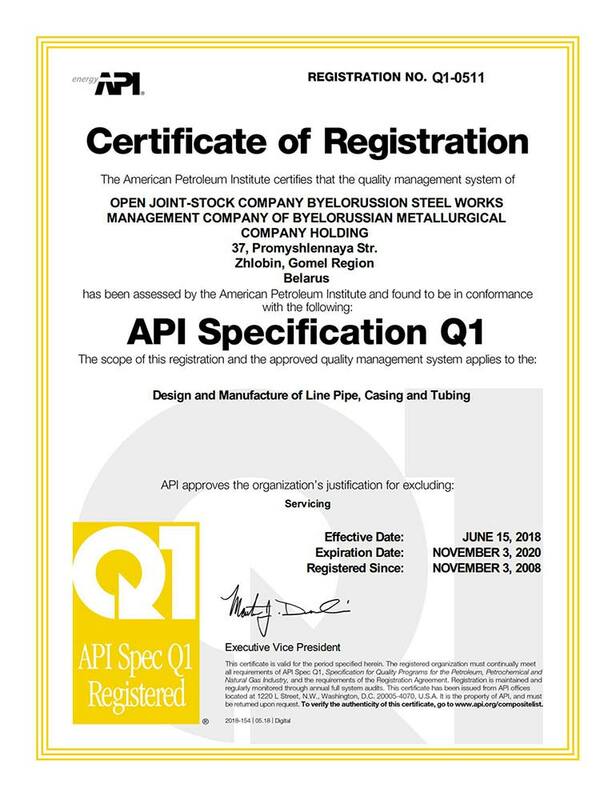 Certificate No.Q1-0511 of quality management conformity with standard requirements API Q1. 2. Certificate of compliance of TUV NORD Systems, Germany, № 07-202-1326-WZ-1011/13 of quality management conformity with requirements AD 2000 Merkblatt W0 and EN 764-5, chapter 4.2 and Directive 97/23/EG for production steel bars and seamless tubes from ferrite steels. 5. Conformity certificate № BY/112 05.01.031 06086 for quality management system according to the STB ISO 9001: 2009 requirements applying to the functions of General designer, development of pre-project (pre-investment) documentation, sections of project documentation in the implementation of construction activities; functions of customer and developer; provision of engineering services for the integrated management of construction activities with the implementation of works engineering supervision.